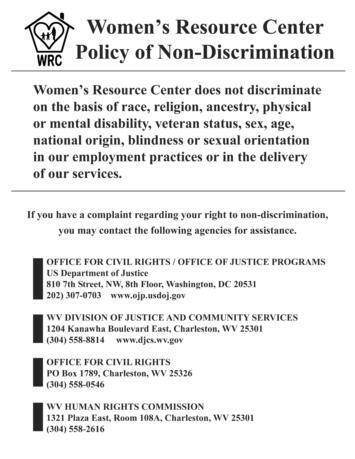 The Women’s Resource Center is committed to the elimination of personal, institutional, and cultural violence against women, children, and men regardless of their race, creed, age, color, national origin, religion, sexual orientation, or disability. By developing strong community support and a professional program, Women’s Resource Center provides safety and quality emergency intervention, advocacy, prevention, and educational services for victims and witnesses of domestic and/or sexual violence. Women’s Resource Center works for systemic changes and changes in public attitudes to assure and empower families with options for building lives free of violence. We are here to listen, not to work miracles. We are here to help victims discover what they are feeling, not to make the feelings go away. We are here to help victims identify their options, not decide for them what they should do. We are here to discuss steps with a victim, not to take the steps for them. We are here to help victims discover their own strength, not to rescue them and leave them still vulnerable. We are here to help victims discover they can help themselves and their children, not to take responsibility for them and their children. We are here to help victims learn to choose, not to keep them from making difficult choices.